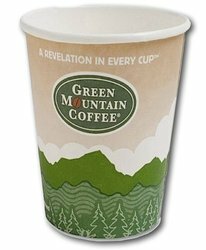 Green Mountain Hot Cups 12 oz. (50 Count). Eco-friendly paper cups that feature a plant-based resin; a 100% annually renewable resource. These 12 oz cups are sturdy, waterproof cups. Each sleeve contains 50 12 oz. Cups. Green Mountain Hot Cups 12 oz. (50 Count). Eco-friendly paper cups with a plant-based resin.